Pluralism, multicultural, multi-religious, multi-linguistic and diversity are the identity of Nepal. According to the national report of 2011, about 63 indigenous people are officially recognized and total 125 Castes including the indigenous and other ethnic group reside in Nepal. More than 100 languages are spoken in the country, which is one of its beautiful parts among the world. Indigenous people have their own culture, language, and custom since their ancestor times. 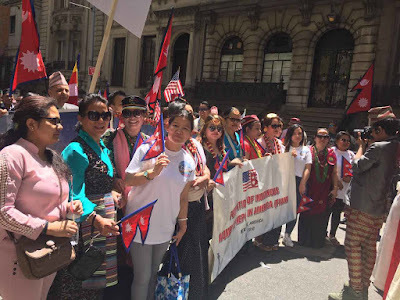 Federation of Indigenous women of Nepal in America (FIWNA) is an association of indigenous women of Nepal in America formed to unite the Indigenous women in orders to preserve our identity, protect and promote them and transmit our cultural heritage to the new generation. This organization officially formed in 2010 and has been registered under the 501 (c) (3) as a non-profit organization. The reason to participate in the Nepal day parade was one of the great virtue and pride of this organization to an extent its cultural entities toward the world. It brought a feeling of united among the Nepalese diaspora together and showed that we are Nepali wherever we go and we live. We love our motherland and think about our nation where we born and want to be the Nepali forever. FIWNA participants chanted a national anthem, danced in a group and recited many songs memorizing the Nepal. There was a feeling that everyone was enjoying in Nepal, not in America. About 40 Nepalese communities were involved under their organizations' banners. Everyone presented his or her own cultural dances, songs, customs, and ornaments. Nepal Day Parade 2017 remarked the historic day of Nepal reflecting the day when Nepal was officially going to the Federal Democratic Republic of Nepal and birth date of Gautam Buddha who is also known as the light of Asia. Both are the most historical and remarkable days consequently are in the same month in May. This day commemorated those days presenting the unity and promoting the identity of Nepal among the world.